The great American composer and lyricist Stephen Sondheim turned 80 earlier this spring, and New York City has been celebrating. 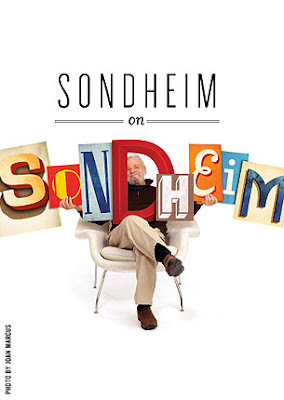 Sondheim is of course the genius behind Sunday in the Park with George, Sweeney Todd, A Little Night Music, and Follies, to name a few of his highest achievements. He certainly is one of the greatest living American artists, and what a great joy it must be for him to be acclaimed like this. Earlier in the season the New York Philharmonic marked the occasion with a concert starring, among others, Patti LuPone, Elaine Stritch, Mandy Patinkin, Bernadette Peters and Audra McDonald. I know – amazing. and a beautiful black and white gown by Carolina Herrera is at home amongst graphic black ink drawings by the great Al Hirshfeld who died in 2003. This week TD and I went to see Sondheim on Sondheim, now on Broadway at The Roundabout Theater which used to be Studio 54 back in the day. It's a biographical anthology of Sondheim's songs, conceived and directed by James Lapine who brilliantly directed Sunday in the Park with George on Broadway. This show includes a cast of six including Tom Wolpat (who TD chats with at our gym), Vanessa Williams, who is coming off her wonderful turn as the villainous Wilhelmina Slater in the much-missed Ugly Betty, and the great Broadway treasure Barbara Cook who this year is 83. 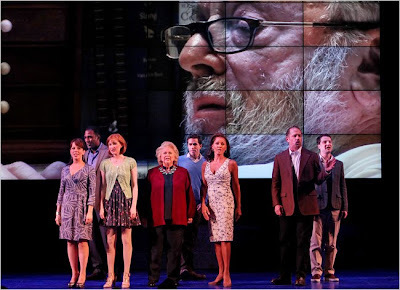 The songs on stage are interspersed with video of clips of Sondheim talking about his life and work played out on plasma screens. You really do learn a lot about the man. Stephen Sondheim grew up on the upper west side in New York City. After his parents divorced when he was ten, he and his mother moved to Pennsylvania. Luckily a nearby neighbor was the legendary lyricist and playwright Oscar Hammerstein who took the boy in as a surrogate father. Sondheim adored Hammerstein and wanted to be just like him. 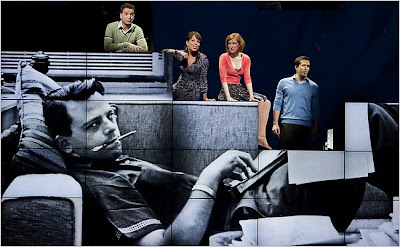 "If Oscar was a geologist I probably would have become a geologist," Sondheim says via video in this show. Luckily he became the most brilliant composer of his age. Sondheim's relationship with his mother was not as happy. He says that when he was forty and his mother was going to have heart surgery, she sent him a note which said that the only regret she had in her life was giving birth to him. The audience gasped when he says this. You know, you never know what people go through in life. He said, "Thank God for Oscar or I might not be alive today." At another point this man who famously wrote about love and affairs of the heart says his first love relationship came along when he was sixty. His work is wonderfully celebrated here. TD and I both thought the first act was a little flat but the second act took off with those powerful, emotional songs that bring tears to the eyes including "Sunday in the Park with George" which visually shows how a work of art comes together, "In Buddy's Eyes" which celebrates love between a couple as they get older, and "Not a Day Goes By" about a love lost but not forgotten. When I met Ted on Labor Day on Fire Island in 1985, he introduced me to the work of Stephen Sondheim and took me soon after to see Sunday in the Park on Broadway. He had already seen it and wanted to take me. That show, about the process of the creation of art, was one of the most beautiful things I ever saw. We went again to see the revival recently in this very same Roundabout Theater. I love Sondheim but Ted does even more so and has been to Chicago and Washington D.C. to see productions. We laugh: He says, "Do you want to go see the new Follies?" and I say, "No Ted I've seen Follies three times" and he says, "But you haven't seen this Follies." But Ted really did bring all these beautiful songs to me. When I hear Stephen Sondheim, I think of Ted. You are so fortunate to live in the enter of the universe at this time. How I would love to see the show. I love Barbara Cook & I have seen her at the Carlyle several times. What a wonderful blog, full of great photos & interesting opinions, plus a peek into the life of 2 handsome men. I will be back... & I wish you the very best! Hi Stephen, I did enjoy your post on Sondheim. "Anyone Can Whistle" is one of the most beautiful, poetic songs; ironically Sondheim says he did not enjoy his time on that show.